The Central Arizona Project allows passage of water from the Colorado River to central and southern Arizona. At 336 miles (541 km), it is the largest aqueduct ever constructed in the United States. Although particularly associated with the Romans, aqueducts were devised much earlier in Greece and the Near East and Indian subcontinent, where peoples such as the Egyptians and Harappans built sophisticated irrigation systems. Roman-style aqueducts were used as early as the 7th century BC, when the Assyrians built an 80 km long limestone aqueduct, which included a 10 m high section to cross a 300 m wide valley, to carry water to their capital city, Nineveh. The Indian subcontinent is believed to have some of the earliest aqueducts. Evidence can be found at the sites of present-day Hampi, Karnataka. The massive aqueducts near river Tungabhadra supplying irrigation water were once 15 miles (24 km) long. The waterways supplied water to royal bath tubs. In Oman from the Iron Age, in Salut, Bat, and other sites, a system of underground aqueducts called falaj or qanāts were constructed, a series of well-like vertical shafts, connected by gently sloping horizontal tunnels. These enabled large scale agriculture to flourish in a dry land environment. taps into subterranean water in a manner that delivers water to the surface without need for pumping. The water drains relying on gravity, with the destination lower than the source, which is typically an upland aquifer. allows water to be transported long distances in hot dry climates without losing a large proportion of the source water to seepage and evaporation. Throughout Petra, Jordan, the Nabataean engineers took advantage of every natural spring and every winter downpour to channel water where it was needed. They constructed aqueducts and piping systems that allowed water to flow across mountains, through gorges and into the temples, homes, and gardens of Petra's citizens. Walking through the Siq, one can easily spot the remains of channels that directed water to the city center, as well as durable retention dams that kept powerful flood waters at bay. On the island of Samos, the Tunnel of Eupalinos was built during the reign of Polycrates (538-522 BC). It is considered an underground aqueduct and brought fresh water to Pythagoreion for roughly a thousand years. Roman aqueducts were built in all parts of the Roman Empire, from Germany to Africa, and especially in the city of Rome, where they totaled over 415 kilometres (258 mi). The aqueducts supplied fresh water to public baths and for drinking water, in large cities across the empire, and set a standard of engineering that was not surpassed for more than a thousand years. Bridges, built in stone with multiple arches, were a distinctive feature of Roman aqueducts and hence the term aqueduct is often applied specifically to a bridge for carrying water. Near the Peruvian town of Nazca, an ancient pre-Columbian system of aqueducts called Puquios were built and are still in use today. They were made of intricately placed stones, a construction material widely used by the Nazca culture. The time period in which they were constructed is still debated, but some evidence supports circa A.D. 540–552, in response to drought periods in the region. The Guayabo National Monument of Costa Rica, a park covering the largest archaeological site in the country, contains a system of aqueducts. The complex network of uncovered and covered aqueducts still functions well. 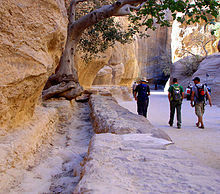 The aqueducts are constructed from rounded river stones, which are mostly made of volcanic rock. The civilization that constructed the aqueduct system remains a mystery to archaeologists; it is suspected that Guayabo's aqueducts sat at a point of ancient cultural confluence between Aztecs, Mayans, and Incas. When Europeans saw the Aztec capital Tenochtitlán, early in the 16th century, the city was watered by two aqueducts. One of these, Chapultepec Aqueduct, built circa 1420, was rebuilt by the Spanish almost three hundred years later. Originally tracing part of its path over now-gone Lake Texcoco, only a fragment remains in Mexico City today. Extensive usage of elaborate aqueducts have been found to have been used in ancient Sri Lanka.The best example is the Yoda Ela or Jaya Ganga, an 87 kilometres (54 mi) long water canal carrying excess water between two artificial reservoirs with a gradient of 10 to 20 cm per kilometer during the fifth century AD. However, the ancient engineering methods in calculating the exact elevation between the two reservoirs and the exact gradient of the canal to such fine precision had been lost with the fall of the civilization in 13th Century. In modern times, the largest aqueducts of all have been built in the United States to supply the country's biggest cities. The Catskill Aqueduct carries water to New York City over a distance of 120 miles (190 km), but is dwarfed by aqueducts in the far west of the country, most notably the Colorado River Aqueduct, which supplies the Los Angeles area with water from the Colorado River nearly 400 km to the east and the 701.5 mi (1,129 km) California Aqueduct, which runs from the Sacramento-San Joaquin River Delta to Lake Perris. 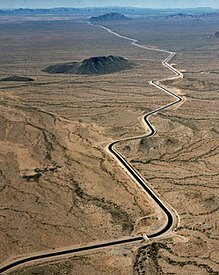 The Central Arizona Project is the largest and most expensive aqueduct constructed in the United States. It stretches 336 miles from its source near Parker, Arizona to the metropolitan areas of Phoenix and Tucson. An aqueduct in New Zealand, "the Oamaru Borough Race" was constructed in the late 19th century to deliver water (and water-power) about 50 km from the Waitaki River at Kurow to the coastal town of Oamaru. In Spain, the Tagus-Segura Water Transfer system of aqueducts opened in 1979 and transports water 286 kilometres (178 mi) from north to south. In China, the South–North Water Transfer Project aims to connect the Yangtze River basin to Beijing through three separate systems. The project will reuse part of the Grand Canal of China. The simplest aqueducts are small ditches cut into the earth. Much larger channels may be used in modern aqueducts, for instance the Central Arizona Project uses 7.3 m (24 ft) wide channels. A major factor in the design of all open channels is its gradient. 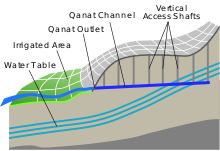 A higher gradient allows a smaller channel to carry the same amount of water as a larger channel with a lower gradient, but increases the potential of the water to damage the aqueduct's structure. A typical Roman aqueduct had a gradient of about 1:4800. An artificial rill, part of the Falaj water transportation system, at Al Ain Oasis, in the Abu Dhabi Emirate. A constructed functional rill is a small canal or aqueduct of stone, brick, concrete, or other lining material; usually rectilinear in cross section; for water transportation from a source such as a river-creek, spring, reservoir, qanat, or aqueduct; for domestic consumption or agricultural irrigation of crop land uses. Rills were traditionally used in Middle Eastern and Mediterranean climate cultures of ancient and historical eras; and other climates and continents worldwide. They are distinguished from a 'water ditch' by being lined to reduce absorption losses and to increase durability. 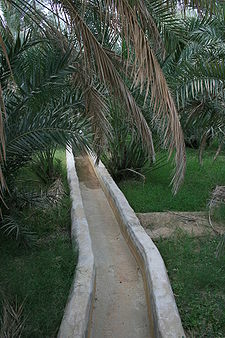 The Falaj irrigation system at the Al Ain Oasis, in present-day Abu Dhabi Emirate, uses rills as part of its qanat water system. Sometimes in the Spanish language they are called Acequias. Rills are also used for aesthetic purposes in landscape design. 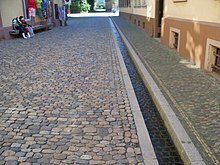 Rills are used as narrow channels of water inset into the pavement of a garden, as linear water features, and often tiled and part of a fountain design. The historical origins are from paradise garden religious images that first translated into ancient Persian Gardens. Rills were later exceptionally developed in the Moorish (Spanish) Gardens of Al-andalus, such as at the Alhambra in Granada; and also in other Islamic gardens, cultures, and countries. Early 20th century examples are in the Maria Louisa Park gardens in Seville, Spain; and at the Casa del Herrero gardens in Montecito, California. Aqueducts sometimes run for some or all of their path through tunnels constructed underground. A version of this common in North Africa and Central Asia that has vertical wells at regular intervals is called a qanat. One historic example found in Syria, the Qanat Firaun, extends over 100 kilometers. Modern aqueducts may also make extensive use of pipelines. Pipelines are useful for transporting water over long distances when it needs to move over hills, or where open channels are poor choices due to considerations of evaporation, freezing, pollution, or environmental impact. They can also be used to carry treated water. Historically, agricultural societies have constructed aqueducts to irrigate crops. Archimedes invented the water screw to raise water for use in irrigation of croplands. Another use for aqueducts is to supply large cities with drinking water. It also help drought prone areas with water supplies. Some of the Roman aqueducts still supply water to Rome today. 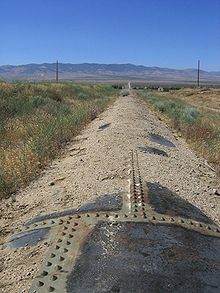 In California, United States, three large aqueducts supply water over hundreds of miles to the Los Angeles area. Two are from the Owens River area, and a third is from the Colorado River. In modern civil engineering projects, detailed study and analysis of open-channel flow is commonly required to support flood control, irrigation systems, and large water supply systems when an aqueduct rather than a pipeline is the preferred solution. In the past, aqueducts often had channels made of earth or other porous materials but significant amounts of water are lost through such unlined aqueducts. As water gets increasingly scarce, these canals are being lined with concrete, polymers, or impermeable soil. In some cases, a new aqueduct is built alongside the old one because it cannot be shut down during construction. The Pont du Gard, constructed in the 1st century, in Southern France. The Valens Aqueduct. a Roman aqueduct in the Eastern Roman capital of Constantinople, now Istanbul, Turkey. Ponte Mantible Aqueduct in Santiago de Compostela, Spain, 12th century. Croton Aqueduct, in New York State, United States, a large and complex water distribution system constructed for New York City between 1837 and 1842. ^ a b c d "Aqueduct". Britannica (CD ed.). 2000. ^ Sewell, Robert (1900). A Forgotten Empire (Vijayanagar): A Contribution to the History of India (Google Books). ISBN 9788120601253. ^ Blake, Beatrice (2009). The New Key to Costa Rica. Ulysses Press. p. 197. ISBN 9781569756966. Retrieved 22 October 2014. ^ Alvarado, Guillermo E.; Soto, Gerardo J. (1 October 2008). "Volcanoes in the pre-Columbian life, legend, and archaeology of Costa Rica (Central America)". Journal of Volcanology and Geothermal Research. 176 (3): 356–362. doi:10.1016/j.jvolgeores.2008.01.032. Retrieved 22 October 2014. ^ Claver, José Manuel (27 October 2015). "El río que nos une" (Opinion). El Pais. Retrieved 8 February 2016. ^ Schulz, Matthias (11 March 2009). "Rome's Tremendous Tunnel: The Ancient World's Longest Underground Aqueduct". Spiegel Online. Wikimedia Commons has media related to Aqueducts.